Progress Namibia, along with partners Hanns Seidel Foundation (Think Namibia), Namibian Youth Coalition on Climate Change, National Youth Council, and the Namibia University of Science and Technology, hosted the first of what will be a series of games called 'Games for the SDGs'. These games aim to provide a platform for Namibian citizens to come together to learn about and discuss the Sustainable Development Goals freely and informally, and even find ways in which we, as citizens, can contribute. 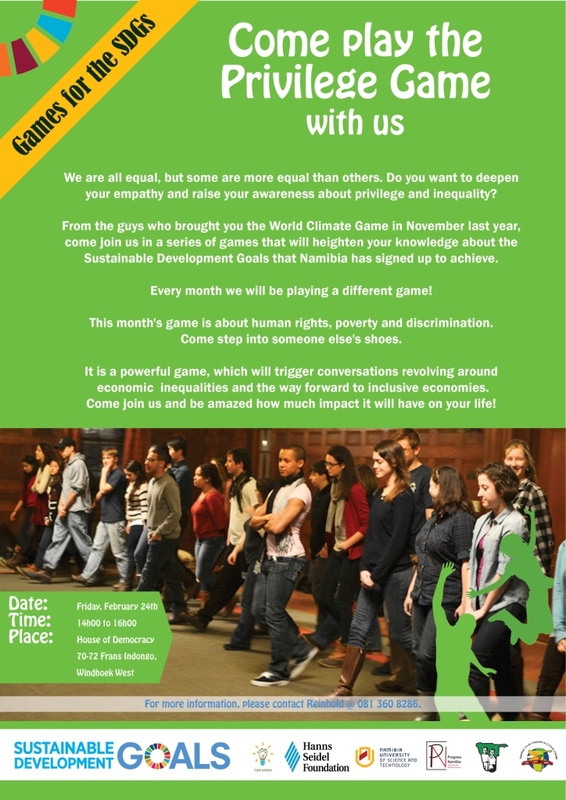 On Friday (24 February) we played our first game, called the Privilege Game. It is a game that raises awareness around privilege in a society, and our own empathy towards other people. The game speaks to inequality (SD Goal 10), but is linked to pretty much all the other goals in one way or another. Participants were given roles to identify with, roles that exist in Namibian society, and were, during the game, given the chance to understand access and privilege around their roles. Depth dialogues ensued after the game, after which we discussed the link of the game and our heightened awareness to the SDGs. The game ran successfully, and we look forward to running a game a month as part of the 'Games for the SGDs' series. All games will be hosted at the House of Democracy, thanks to the Hanns Seidel Foundation's Climate Change Project. The next game will take place on Friday, 31 March 2017, between 13:45 and 16:00, and will be a board game focusing on Flood Resilience. Come learn and share with us, the last Friday afternoon of every month. Follow us on facebook to find out when and what the next game will be about.